Mathew: Do you have any idea how embarrassing it is when you say stuff like that? Helm: 'Tis not embarrassing. I am simply stating a fact. Over the last 15 years, Hanson has matured from an energetic rock trio into an accomplished and even transcendent indie power pop phenomena. Eight albums and their concert at the Aladdin Theater Monday night proved it. I dare you to contradict me. I dare you. Mathew: How is it possible that you like Hanson? How does that jibe with your whole mightier-than-thou-holy-Norse-warrior-of-the-light-tough-guy-thing? Helm: Their music is catchy and their upbeat attitude infectious. Even a fool such as you can appreciate that. Mathew: Dude. This is Hanson we're talking about. The Mmmbop guys. Helm: Ahhhhh. Mmmbop. The youthful exuberance of that song made me long for the ability to dance the first time I heard it and the words take on a certain heart-breaking poignancy to hear them sung 15 years down the road. "Can you tell me who will still care?" Mathew: Please don't start singing again. The one thing worse than having a song stuck in your head is having a song thrust in your head by a helmet with a lousy singing voice. Helm: There is nothing wrong with my singing voice! Mathew: Fine, whatever. Just don't sing Mmmbop again. Please. Helm: That is not even their best song. Not by a bow-length. Mathew: Not by a bow-length? Helm: Not nearly. I am torn between Give a Little and Kiss Me When You Come Home for the honor of my favorite. They nearly brought down the house with those songs! Mathew: Didn't the whole thing feel a little... I don't know... Disney to you? Helm: YES! EXACTLY! You have captured the magic of it! Thank you! Their performance was so pure and... delightful. It was uplifting. Mathew: Are you totally gay? Helm: If by gay you mean light of heart and happy, then yes. Who could help but feel a certain gaity after such a rousing concert? Mathew: I should never have let Jill drag me to see them. Helm: Her appreciation of Hanson is, perhaps, the one thing I appreciate about her. But it is time you admit that you enjoyed the show as well. It was impossible to miss you wiggling that massive rear of yours. And you shrieked like a love- struck teenage girl when the band re-took the stage for their encore. You were as carried away as the rest of the crowd. Admit it now and I will spare your life. Mathew: Look, I never said that I don't enjoy some of their music. Hanson transformed themselves from a kiddie heart-throb boy band into a credible rock group. I totally appreciated Taylor Hanson's collaboration with Adam Schlesigner (Fountains of Wayne), Bun E. Carlos (Cheap Trick) and James Iha (Smashing Pumpkins) for the band Tinted Windows. I think Shout it Out is a really solid album. But a lot of their stuff is still kinda light weight and sappy. 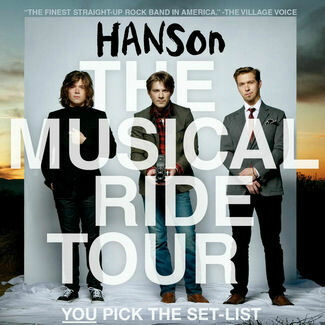 Helm: Admit that Hanson was awesome in concert and that they rocked the house like a trio of young gods. ADMIT IT! ADMIT IT NOW! Mathew: Well... I guess they did rock out.